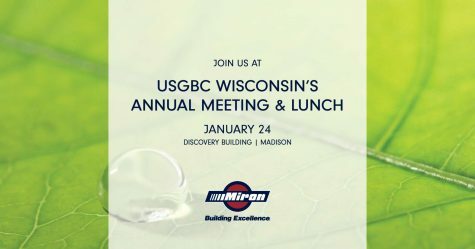 Miron Construction is a proud sponsor of the upcoming United States Green Building Council (USGBC) Wisconsin annual meeting and luncheon, taking place on January 24 at the Discovery Building in Madison. The luncheon’s theme – Moving Wisconsin’s Economy Forward: Leveraging a Sustainable Built Environment – will feature guest speaker Lt. Governor-Elect Mandela Barnes who will elaborate on new places and opportunities on the horizon, including the new administration’s commitment to the Green Built Economy. The program will wrap with a panel discussion that will allow attendees to take a fresh look at how upcoming generations are influencing our economy, corporate responsibility and our built environment. Panel members include sustainability leaders from Marquette University, Madison College and UW Madison, and will be led by UW System Sustainability Director Melissa Nergard. Many know about Miron’s commitment to building green and how sustainability is an integral part of our corporate culture. But did you know that Miron has more than 50 LEED projects valued at $892.7 million in a variety of markets? Or that 154 of our employees are LEED credentialed? Or that Miron is the only Wisconsin contractor to make the Engineering News-Record 2018 Top 100 Green Building Contractors list? Or that we had the first Fitwel project in Wisconsin and the first Parksmart project in Wisconsin? Here at Miron, we don’t just talk about sustainability – we’re committed to corporate-wide initiatives that have been integrated into our business practices and construction operations, which are aimed at expanding our teams’ green knowledge and capabilities, sharing best practices with our partners and extending sustainable leadership to our clients. These efforts also include supporting programming like USGBC Wisconsin’s annual meeting and luncheon. We hope to see you there! Read more about sustainability in our News & Resources Center.